In today’s open space we investigate the role of emotions in collaborative practices with HIROKO TSUCHIMOTO. 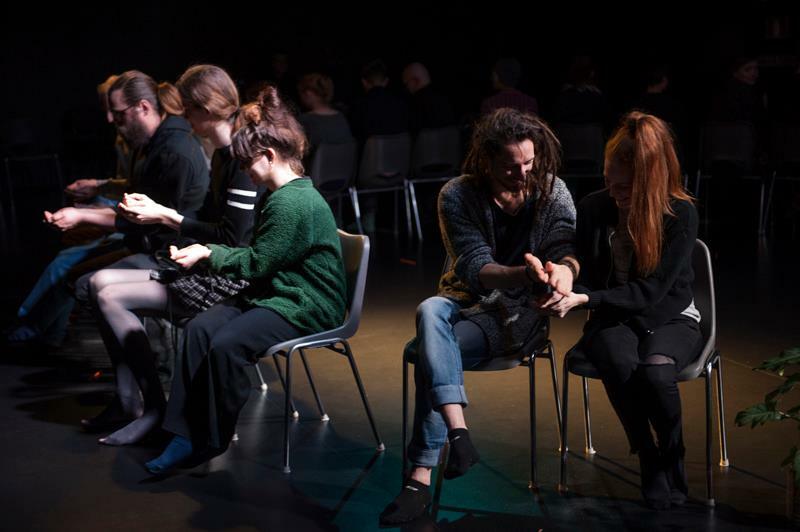 This performance workshop provides an opportunity for participants to become more aware of modalities of emotion through physical and conversational exercises. We investigate the subjects of individual/group feeling, meta-emotions, emotional performativity, (limits of) empathy and (non-) existence of collective emotions. We also conduct discussions about topics including: identity, sense of belonging, mob mentality, mass-panic, group-based shame, membership guilt, etc. The workshop leader navigates the participants toward creating intimate conversations and collaborations, and carrying out group performances in the public sphere. The aim of the workshop is to facilitate critical observation of the participants own emotions and performativities, and to give them sufficient confidence to present public performances. Donations are welcome and all going to Hiroko! See for more information and the program the Facebook event. Hiroko Tsuchimoto is performing ‘PERFECT HAPPINESS’ at 16/06/2018 in the city centre of Enschede. The performance starts at 15:00 at the Oude markt in Enschede.